During the long winter lay-up plenty of things can go awry. Make sure none of these winter disasters ruin your boat. Hopefully this year you watched our videos on How to Winterize a Four Stroke Outboard or How to Winterize Your Stern Drive and Pressure Water System, and read through our entire How to Winterize a Boat guide. Hopefully you did everything right, and your boat will enjoy a peaceful winter slumber...hopefully. Unfortunately, however, many of us will spend the spring fixing all the things that went wrong during the off-season. And if any of the winter disasters outlined here strike your pride and joy, it could be long and painful. Is it time to take some extra precautions? Maybe so—read up on these five winter disasters, and make sure none of them are possibilities when it comes to your boat. 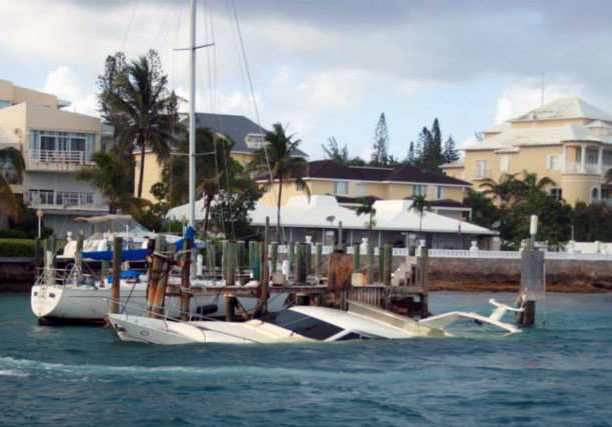 When it comes to boats, scenes like this may well be the ultimate in "oops." 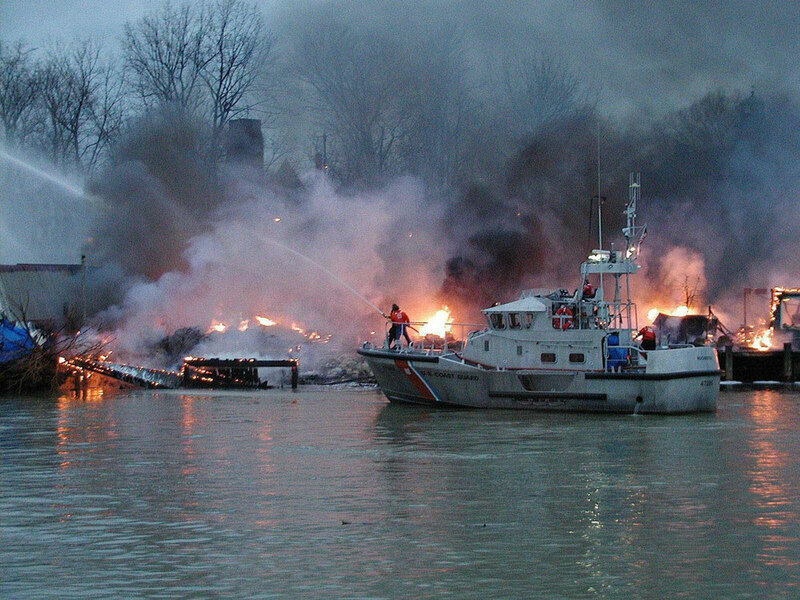 Photo courtesy of the USCG. 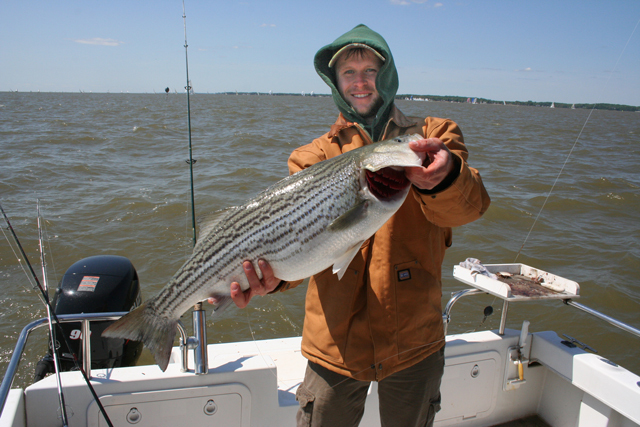 Here’s a way we sometimes do more harm than good when we wrap up our boats for the winter. Using the common blue tarp for a winter cover is the root of the problem; if you don’t put some sort of padding (such as a sheet or blanket) over an outboard’s cowl, and your tarp comes in contact with it, you’re in for trouble. Those tarps are abrasive, and when they billow in and out or shift in the wind, they’ll rub the shiny finish right off your outboard. True, there won’t be damage if you secure the tarp well enough that it doesn’t move one iota. But that’s nearly impossible to do if winds over 20 knots or so blow through. Either pad that cowl generously, or have the boat shrink-wrapped instead of covering it with a tarp. Note: this same type of issue can arise if the tarp comes in contact with shiny gel coat, and rubs your fiberglass the wrong way. 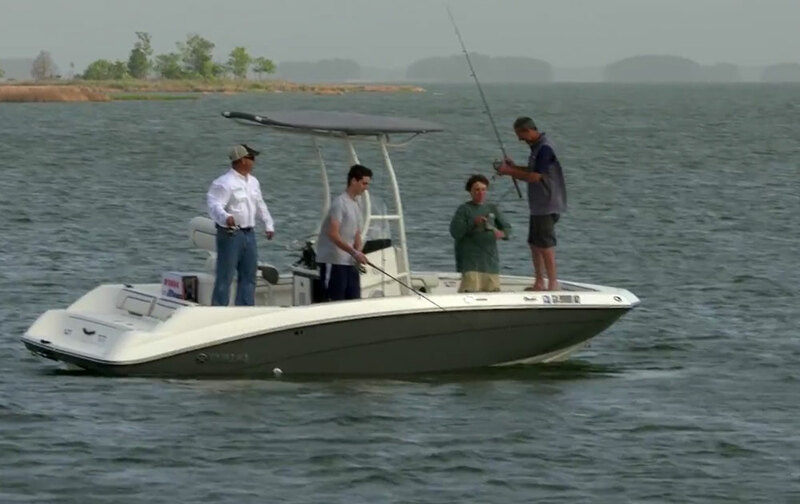 Most boaters already know that the majority of sinkings occur in the slip. But you might not realize that close to 10 percent of those sinkings occur because water flowed in through a fitting that was above the waterline. How can water possibly come in from a fitting that’s not underwater? Snow. 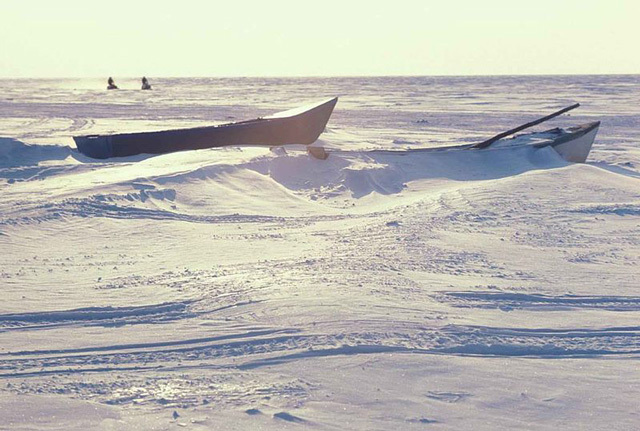 Snow adds weight, pushing the boat deeper and deeper into the water until… you get the picture. The key to avoiding the snow-triggered sunk-in-the-slip disaster is twofold; constantly visiting your boat, especially right after a snow fall (obviously, after a heavy snow you may need to clear the decks), and making sure it has plenty of power either from shorepower or well-charged batteries, so the pumps will keep running if water does start coming in. Note: some manufacturers also recommend plugging the exhaust ports on an inboard-powered boat that spends all winter in the slip. 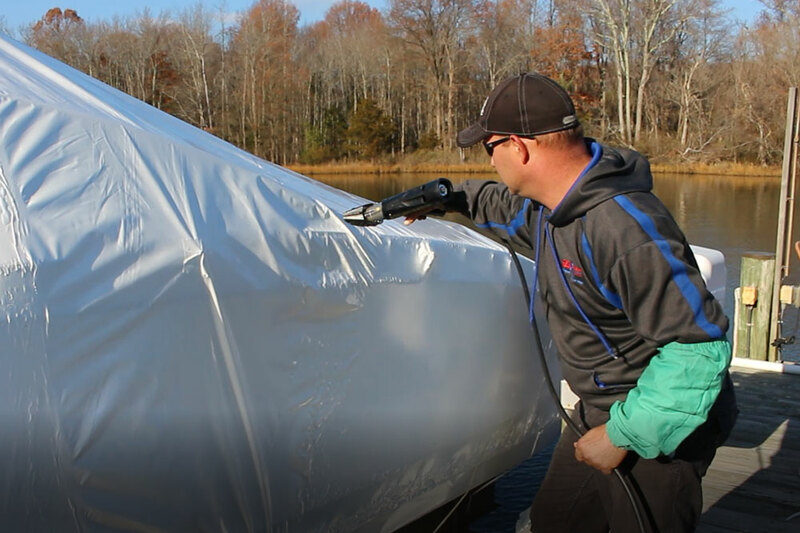 Your boat's cover - even if it's shrink-wrapped - requires some attention through the winter. Anyone who’s owned a boat long enough to remember the days before shrink-wrap has probably been down this road. Many of us still use other forms of covers, and even shrink wrap can sometimes succumb to the weight of snow and the battering effects of wind. And if that cover collapses, your boat’s going to suddenly become exposed. Again, the main way you can defend against this issue is by consistently checking Mom’s Mink, and making sure everything's ship-shape. A collapsing cover may not be preventable but if you discover what’s gone wrong in a matter of days instead of weeks, you can make some quick repairs and minimize the damage. According to our shrink wrap expert, in order to prevent a wrapped boat from having issues you should tap the cover with a soft broom so the snow slides off, when it exceeds six inches. See Shrink Wrapping a Boat, for more information on shrink wrapping. When boats are stored ashore and you don’t have a trailer, the job is usually left to the marina to haul and block the hull—as it should be. 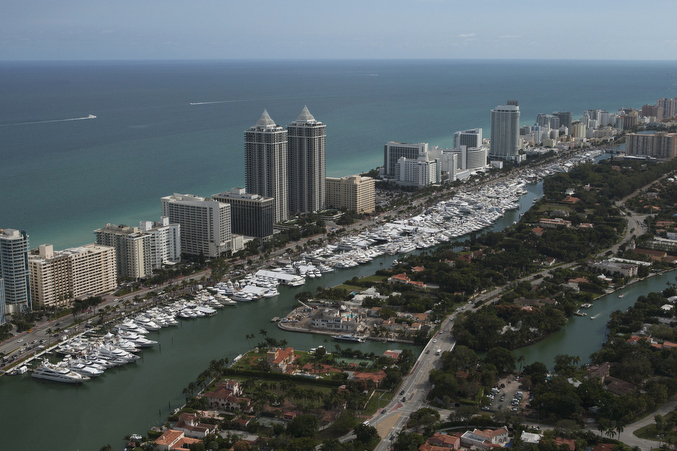 First because the professionals know how to do the job a lot better than the average boater, and secondly because any reputable marina will carry the appropriate insurance in case something goes wrong. That doesn’t mean, however, that you shouldn’t do a little checking up on the job they’ve done. Naturally, the boat needs to be sufficiently blocked so it won’t fall over. Generally speaking, two stands per side is only sufficient up to about 26 feet. If your boat is bigger, additional jack stands should be in place. But most of the weight will be sitting on the boat’s keel, which should be supported by wood blocks. If not, your boat could suffer a broken back. Here's a prime example of how not to store your boat through the winter months. Even with blocks in place, damage is still a possibility. It’s important for the boat’s weight to be evenly distributed, and to prevent all the weight from settling in one area. Naturally, we expect that you eyeballed the boat after it was initially hauled and blocked. But did you go back and look again, two weeks later? Jack stands and blocks sometimes settle, especially after a hard rain, and this can cause shifts in the load. So once again, periodic check-ins through the winter are a key part of ensuring smiles, come spring. Do you leave a space heater onboard, to keep things warm and dry? If so, get in your car right now, go to the boat, and get rid of that heater. 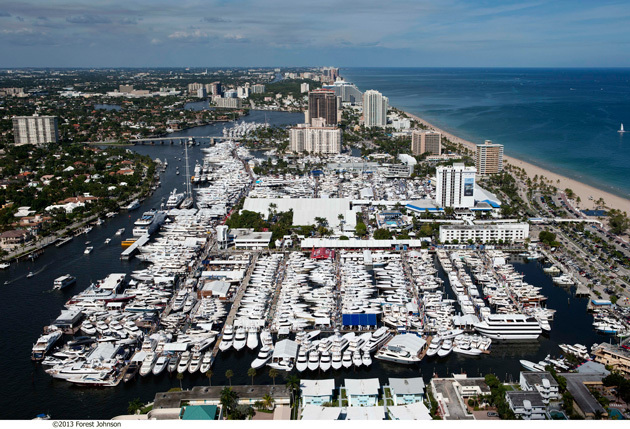 Insurance claims from BoatUS prove that this is the number-one reason why boats stowed for the winter go up in flames. Maybe instead you left a light-bulb burning onboard. This is a time-honored method of keeping bilges warm, but it’s also unacceptable. Bulbs can trigger an explosion if vapors build up, if the bulb comes into contact with flammables it can start a fire, and the average light bulb only has a life-expectancy of 750 hours. That means it’ll probably burn out after a month or so, and won’t last all winter anyway. So, what’s the proper fix? It’s simple—instead of depending on an additional heat source to prevent freeze damage, fully winterize the boat. The most freeze damage claims are generated in places with relatively mild climates, like California. In such areas many boaters don’t consider winterizing 100-percent necessary, and instead they depend on half-measures—like a light bulb—to get through the winter. Bad move. If there’s any chance of freeze damage where you live, fully winterizing the boat is your best bet. BONUS TIP: If your boat is stored on a trailer, make sure it isn’t parked next to a building with a sloped roof. Otherwise, snow could avalanche right onto your boat and cause some serious damage. Editor's Note: This article was originally published in November 2014 and updated in October 2017. 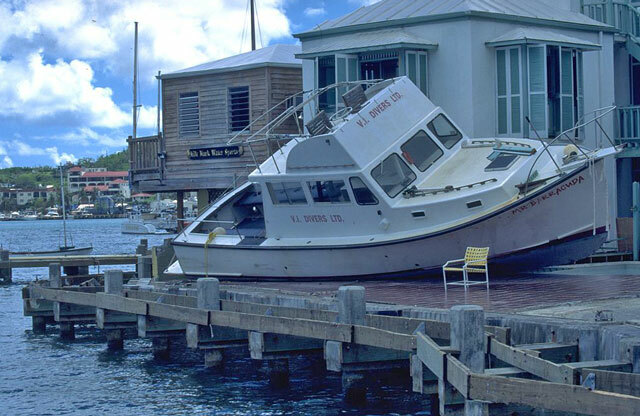 Five Docking Disasters: Don’t Let This Happen to You! 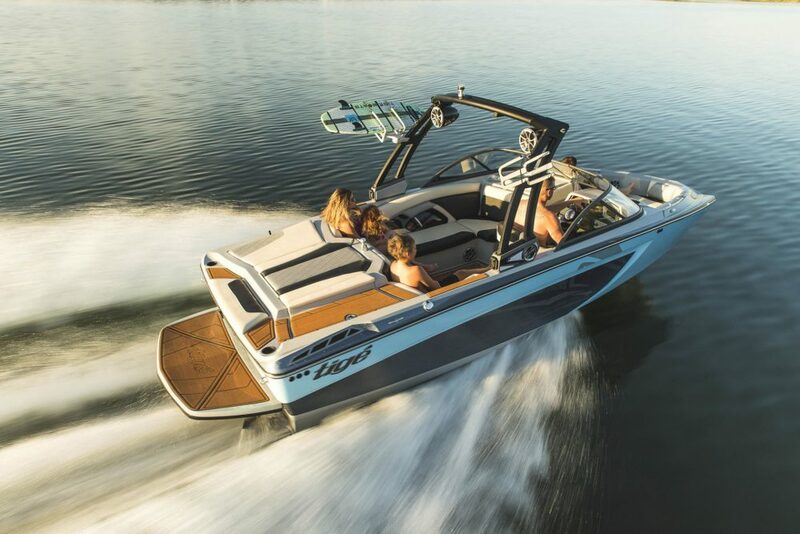 Should You Get a T-top, or a Bimini Top?